In part one of this series I highlighted the connection between the Nervous System and the Immune System. Previously viewed as two separate entities, these can now confidently be viewed as one interconnected system. However it is this exact relationship that influences the physical capacity of our nerves and driving the neural symptoms often experienced in the arms and legs. In part two, we will discuss neurodynamic testing as a tool to evaluate these physical capacities and how they may be restricting our movement patterns. It may be surprising, but our neural structures are the most resilient human tissue we have. Think about how adaptive they must be in real time. Every step we take, door we open, or Saturday night dance move we bust is only achievable because our nerves are able to efficiently adapt. If our nerves did not glide, lengthen, and shift none of this would be possible without eliciting neural tension. A happy nerve demands, blood flow, space, and movement to function optimally and the restoration of these is fundamental to treatment. But how do you know which is needed? Insert neurodynamic testing. 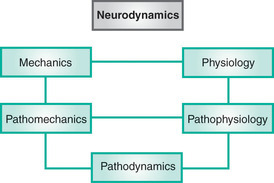 To be effective with neurodynamic testing there has to be an understanding of the science between normal neural mechanics and neural physiology. In other words, neurodynamics assess and treat the physical health of the nervous system. When pathology exists in either the mechanics or physiology of a nerve it can disrupt the conductivity of the nerve making the communication between the nerves, brain, and muscles inefficient. This can be difficult to treat effectively, if not identified correctly. However the use of neurodynamic testing intentionally positions and loads a nerve to help communicate where the dysfunction is stemming from. This testing thereby identifies the capacity of a nerve to slide, glide, angulate, strain or compress efficiently. * Fun fact: A peripheral nerve can lengthen approximately 12-20% to accommodate normal movement, while the spinal cord can elongate nearly an inch! So, those tight hamstrings may not be due to muscle tightness, if you have symptoms into the legs, it could be a restriction within the nervous system. Neurodynamic tests are thus designed to bias neural elements more so than the surrounding interfaces. This intentional loading of a specific nerve root, trunk, and localized region of the spinal canal, and/or sympathetic nervous system allows us to grasp a deeper understanding of where the symptoms are being generated from to treat the cause rather than the symptom. Here is a video from David Butler to help further explain how our nerves move! Check it out.